Malaysia has canceled its visa waiver arrangement with North Korea amid a diplomatic spat over the assassination of the half brother of the North's leader, a news report said Thursday. The cancellation will take effect on March 6, after which North Koreans entering Malaysia will be required to obtain a visa, Malaysian news agency Bernama quoted the country's deputy prime minister, Ahmad Zahid Hamidi, as saying. He cited national security as the reason. This marks Malaysia's first tangible action taken against Pyongyang following the assassination of Kim Jong-nam at Kuala Lumpur International Airport on Feb. 13. Kim was killed within 20 minutes of two Asian women allegedly smearing his face with VX nerve agent, a banned chemical weapon. The suspects claimed they had been deceived into thinking they were part of a prank show. Both were formally charged with murder on Wednesday. The Malaysian police concluded that eight North Korean nationals including a diplomat based in Kuala Lumpur and the two women were suspected of being involved in Kim's killing. But Pyongyang accused South Korea and Malaysia of cooking up the story. 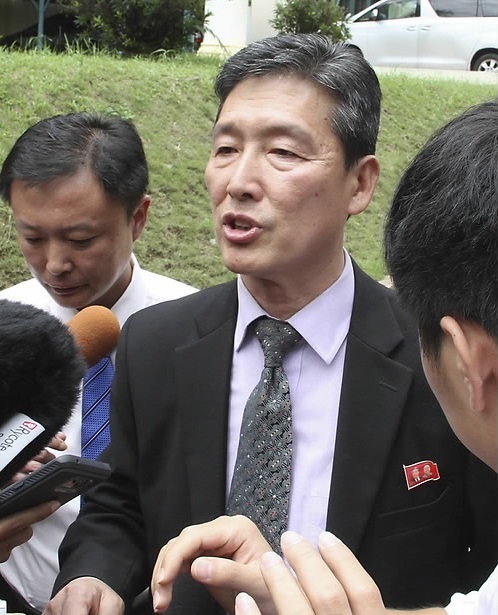 Malaysia has decided to release and deport Ri Jong-chol, a 47-year-old North Korean suspect, due to a lack of incriminating evidence, AP reported. Four North Korean suspects are believed to have fled Malaysia on the day of Kim Jong-nam's death while three others including Hyon Kwang-song, the second secretary at the North's embassy in Malaysia, are wanted for questioning. South Korea's spy agency told lawmakers on Monday that Pyongyang's foreign ministry and spy agency were behind Kim's killing. Malaysia formally established diplomatic relationship with North Korean in 1973 and installed its embassy in Pyongyang in 2003. In 2009, they forged a visa waiver program through which about 1,000 North Korean workers are currently employed in Malaysia. On Tuesday, North Korea sent a high-level delegation led by former deputy ambassador to the United Nations Ri Tong-il to Malaysia as it seeks to take custody of Kim Jong-nam's body. Ri said he will also request that Malaysia release the one North Korean national detained over the incident and discuss ways to strengthen friendly ties with Malaysia.